Gold in Dubai has come a long way since the days of the sand course at the Dubai Country Club. Golfers no longer have to take their shots from pieces of Astroturf and the ‘browns’, made of compacted sand and oil, have been replaced by lush grass greens. Today the city is well established as a golf tourism destination. New courses are opening all the time, most endorsed or designed by one of the top professionals. Green fees are expensive when compared to other countries. With almost zero rainfall irrigation is expensive and intensive. Rates are cheaper in the hot summer months. 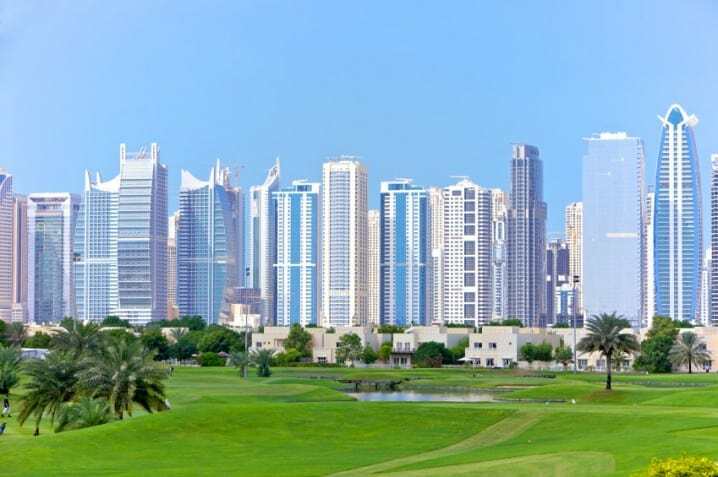 Championship course at Dubai Festival City designed by Robert Trent Jones II. 18-hole course designed by Ian Baker-Finch and Nicklaus Design. Facilities include a driving range, par 3 course, and a small hotel. The clubhouse here is one of the iconic sights of Dubai. Opened as the Wadi and subsequently redesigned by Nick Faldo. Hosts the Dubai Desert Classic. The first sports facility completed at Dubai Sports City. 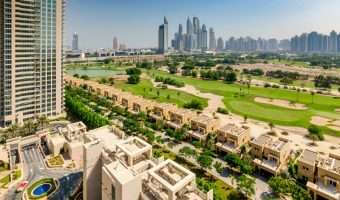 Luxurious golf resort at one of the most exclusive residential communities in Dubai. 9-hole course at the Jebel Ali Golf Resort & Spa. 9 hole pay-and-play course next to the Meydan racecourse. Golf course designed by Nick Faldo.